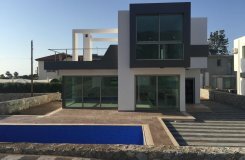 Our professional sales team will help you to select your North Cyprus property to be purchased, to agree verbally on the price and on the payment terms with the seller. The purchase terms and the price may need to be negotiated with the seller, and working in consultation with you, Royal Estates sales team will negotiate on your behalf until the price is agreed. Once a verbal agreement has been reached between the parties, the buyer pays a non-refundable holding deposit to Royal Estates, or to his/her solicitor to show his/her good will, in order for the property to be taken off the market. The reservation deposit is a minimum of £1,000 Stg. and paid by cash, credit card or via bank transfer. A receipt is issued and deposit is included in the sales contract as part of the payment. The property is reserved for the buyer at the agreed fixed price for a limited time of 2-3 weeks until the buyer signs the sales contract and transfers the payment. Royal Estates or the buyer‘s solicitor completes a full search of the Title Deed of the property to ensure that the seller is the owner of the said Title Deed and that the property is free of any encumbrances, mortgages, charges, liens or debt. In the case of there being and problem or encumbrances of the property, then the initial holding deposit will be immediately refunded in full any contract drawn up will be void. We usually advice our clients to register their sales contract at the land registry office and then make the payment to the seller just to make sure that the property is clean. The contract of sale will be drawn up, in English, by the buyer’s solicitor, Royal Estates or by certified public notary, which will reflect all the agreed terms & conditions of the sale, specifications of the property, payment plan, etc. The solicitor will then go through the contract with the client. Any corrections or changes can be made at this stage. When the client is happy with the contract, it is signed in the presence of a public notary or the solicitor by the buyer, the seller and two independent witnesses. If the buyer has to leave Cyprus before the contract is ready, then the buyer can leave Power of Attorney with a solicitor or a trustee so that the solicitor/trustee can sign on his/her behalf when buying properties in Northern Cyprus. In this case, the contract will be faxed, posted or e-mailed to the buyer by the solicitor or by Royal Estates for the buyer to approve before signing. The buyer will then have 10-14 days to make the first instalment or full payment in the case of a completed or resale property. According to the new estate agency law, once the contract is signed, the buyer needs, within 21 days, to pay the stamp duty at 0.5% of the agreed price and register the contract at the Land Registry. The purpose of this new law is to protect the buyer’s ownership rights. Once the contract is registered at the Land Registry, the seller cannot sell this property to anyone else or put it under mortgage. By this new law, your property will be safe until you get your permission to get your Title Deeds. Non Turkish Cypriot buyers must apply to the Council of Ministers to obtain permission to have the Title Deeds transferred to their name. The buyer’s application for ‘Permission to Purchase’ (PTP) can be prepared and submitted by Royal Estates. Alternatively, this can be prepared by a solicitor; costs vary between £200 Stg and £1000 Stg. For this PTP application we need a photocopy of the buyer’s passport and statement of the buyer’s criminal record (character report) which can be obtained from the buyer’s local police station (original copies must be submitted). This must be newly dated document. The Northern Cyprus Government is currently taking approximately 6 months to process PTP applications. The lack of a Title Deed does not prevent the buyer from selling the property. Between the time that the buyer signs the contract of sale and he/she actually receives the Title Deed; the buyer owns the property ‘on contract’. When the seller signs the sales contract, the seller relinquishes any rights over the property and gives full ownership to the buyer. At this stage the buyer can also demand a irrevocable POA from the seller to this effect. Property buyers are free to sell, rent or modify their property once they take possession of the property. When the permission is granted by the Council of Ministers, both the seller and the buyer pay the relevant property transfer taxes and the seller transfers the Title Deed onto buyer’s name at the Land Registry. The seller pays the Capital Gains tax currently at 4% and the buyer pays Stamp Duty currently of 0.5%, VAT currently at 5% and Title Transfer Tax currently at 3%. Non TRNC citizens are only allowed to buy one property in their name. • Once the purchase permit has been issued, the seller will then transfer the Title Deed onto the name of the buyer.